Fairfax countyloudoun countyArlington CountyAlexandria countyWashington DCMontgomery countyPrince George county. 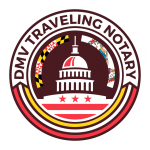 DMV Traveling Notary & Apostille is established in doing tasks relevance to notarizing documents of different kinds like estate planning, real estate, financial agreements, immigration, contracts and a whole lot more. We are fully equipped in tackling all assignments where a notary public seal is needed. We will match you with any of our staff member for your situation. Being a one-call solution for your mobile notary requirements, our fees cover all costs to offer you the best service. Being a trained, insured and licensed notary agency in Washington DC, Southern Maryland and Northern Virginia we will be ready in performing hundreds to thousands of notary signings all throughout the state throughout the years of our business. Only the most reliable and most professional notary services are offered to meet your guaranteed satisfaction. Realizing your energy and time are valuable, we are bringing our services to you by traveling to your place of work or home 24/7 days a week with appointment.